Learn why it’s time to change to a built-in central vacuum system from The Vacuum Store in Los Gatos. The central vacuums we sell and install are either from CycloVac or MD Central Vacuum, both have been leaders in the central vacuum industry for many years. MD’s product lines, Silent Master, Modern Day, AirMaster, and FloMaster, are designed and assembled in the USA and backed with a transferable 12-year warranty. They are superior to regular vacuums in every way. Here are a few benefits. Quieter – Think about it. The motor is typically in your garage, away from your living quarters. You can vacuum when your family is sleeping! 2-3 times more powerful suction gets your carpets cleaners! No power cords to get in the way! No re-circulated dust particles that trigger allergies or require re-dusting your home! Lightweight – No more carrying a heavy vacuum cleaner up the stairs! The Heart of the Central Vacuum System the power unit creates all the suction needed for cleaning your entire home. Central Vacuum Tubing, connectors and parts needed for installation of Central Vacuum Systems. Complete Kits of everything needed inside the home for your Central Vacuum System. Full Selection of Hoses, Tools & Attachments for you Central Vacuum System. CycloVacs exclusive DataSync technology allows the selection of four power levels; signals when to change the bag or empty the canister; and even indicate when mechanical maintenance is recommended. All this information is available right on your hose handle! 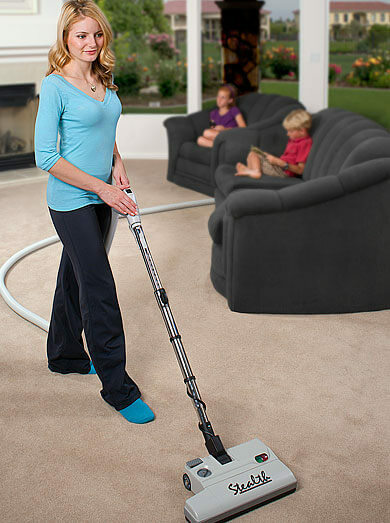 Simply plug in the hose and experience all the benefits of a central vacuum. Installs in new construction and existing homes. The Hide-A-Hose retractable hose management system stores the hose in the pipe. Pull out to use it, then simply let the suction pull it back in. Drop by the store in Los Gatos to learn more about central vacuums today!